If you’re buying a knife set, look for one that has everything you could possibly need. This set includes a 4 1/2-inch paring knife, a 5-inch boning knife, a 5-inch santoku knife, a 5 1/2-inch tomato and bagel knife, a 6-inch utility knife, a 6-inch fork, a 7-inch santoku knife, an 8-inch chef’s knife, a 8-inch slicing knife, an 8-inch bread knife, eight steak knives, kitchen shears, and a dark-colored wooden knife block. This set has one feature that makes it different from most others—the knife block has integrated sharpeners in selected slots, so the knives get a little sharpening every time you put them in or remove them from the block. The knives are also labeled, so you can see which knife you’re grabbing before you remove it from the block. The steak knives are made from stamped Asian steel, the other knives are made from forged German steel. 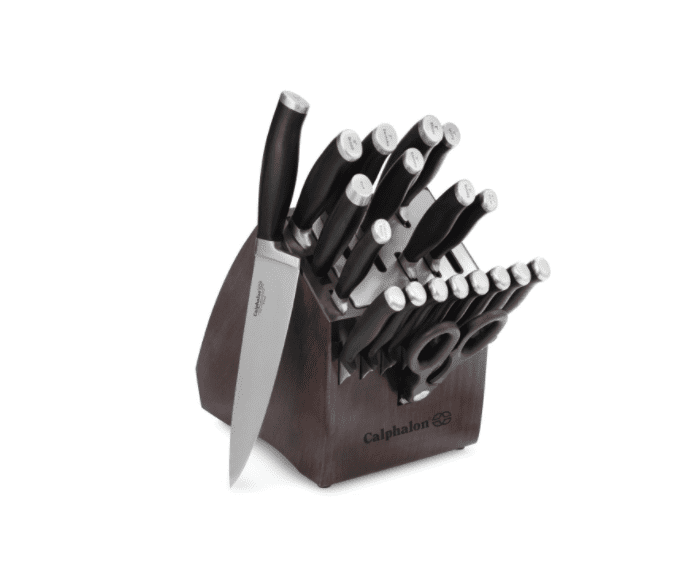 This is one of the larger knife sets available, with every knife you might need. However, if you know you won’t use all of these, there are smaller sets available as well, and at a lower price point. Still can't decide on what you want? Our round-up of the best knife sets can help you find what you're looking for. This set has quality carbon steel knives at a budget price. It includes a 3 1/4-inch paring knife, a 3-inch peeler, a 5-inch utility knife, a 7 3/4-inch chef’s knife, and 8-inch slicing knife, a 7 3/4-inch bread knife, a 5-inch partoku, a 7-inch santoku, eight steak knives, a sharpening steel, and a wooden knife block. The high-carbon stainless steel resists stains and is easy to sharpen, and the knives have comfort-grip black poly handles. These knives are made in China. A chef’s knife is a multipurpose tool that’s a must-have in every kitchen. It’s used for chopping, mincing, and dicing. If you don’t have a slicing knife, you can use this to slice your roast, and the wide blade makes it perfect for smashing garlic before mincing. This knife is made in Switzerland by the same company that makes Swiss army knives. They use a special tempering process that makes it easy to re-sharpen the blade when needed. It has a high-carbon stainless steel blade that is laser-tested to ensure the best cutting edge. The handle design is patented, and has a textured, slip-resistant grip, and an ergonomic design. Unlike more expensive knives, this does not have a full tang (meaning that the handle is in two pieces around the knife blade, which extends into the handle), but it is still well-balanced and easy to hold. A paring knife is a kitchen essential, and this one from OXO offers great performance at an affordable price. It has a fully forged blade, bolster and tang made from high-carbon German stainless steel for good edge retention, so you won’t need to sharpen as often. The knife has excellent balance and a contoured handle for great control while performing small tasks like peeling, slicing or chopping small amounts of food. The curved bolster offers support for the thumb and forefinger for a proper grip that is both comfortable and efficient, and the handle has a non-slip grip so you’ll feel confident when using it. The knife should be washed by hand. While a bread knife isn’t essential for every kitchen, if you bake your own bread or buy unsliced bread from a local bakery you know the frustration of trying to slice through a fresh loaf that has a crisp or chewy crust and a soft interior. A bread knife is designed to do exactly that, leaving you with perfect slices and a loaf that isn’t smashed in the process. This 8-inch knife, made in Germany, is a good length for slicing through most any size of bread loaf, and the serrations grab and cut through tough crusts easily, all while treating the soft inside of the bread gently. The synthetic handle offers good grip and balance. Besides using it for bread, this knife also works well for slicing cakes into layers, however you might want a 10-inch serrated knife if you use it frequently for 8-inch round cakes. It’s great to have a set of steak knives that look good and perform well. These have 5" blade that have an upswept boning tip that helps separate in between the meat and bone while the cambered long blade helps cut through the meat. Constructed of German high carbon stainless steel which gives it a sharp edge that lasts a while, making them a mainstay at your home for years to come. They are made in China which helps bring you a more affordable price that makes them a good option for everyday use. What's more the brand has a lifetime guarantee from manufacturing defects so if you have any issues they will offer you a refund. Take a look at other product reviews and shop for the best steak knives​ available online. 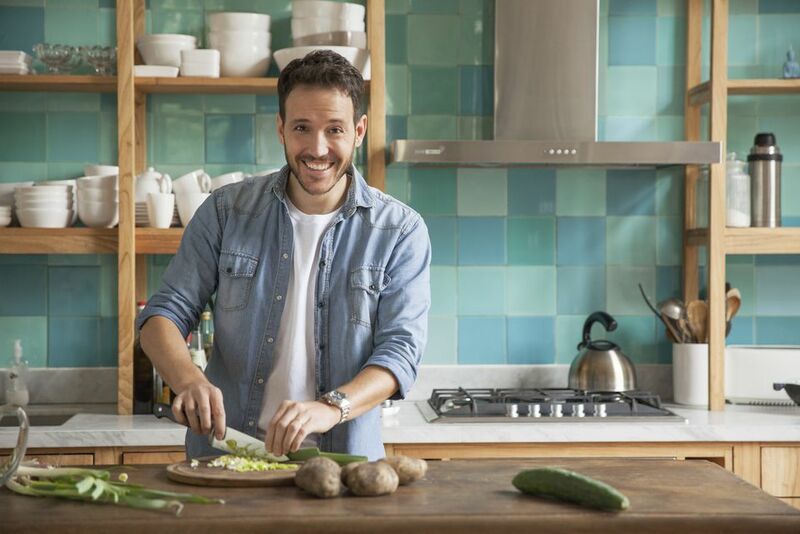 Buying a set of knives can be a burden on your wallet — that's when ceramic knives might be a smart option for your college dorm room, second home or your main abode. Ceramic knives get the job efficiently and often in a brightly hued style. This set comes with five knives and five sheaths so you could travel with these if you plan on cooking on vacation. While the price is low, that doesn't sacrifice performance. These knives do a stellar job at chopping, dicing and slicing your way to meal time. With 90% 5-star reviews you know this is a sure bet. Read more reviews of the best ceramic knives available to purchase online. While a boning knife might not be the most-used type of knife, it’s exactly the tool you need when you’re deboning meats. Cut up your own chicken and save money over pre-cut pieces, and this knife will pay for itself. Made from Japanese high-carbon steel, this has a razor sharp edge and is easy to resharpen while it also resists rust and corrosion. The ergonomically designed handle is made from Santoprene for comfort and polypropylene for durability and has a colorful inset in seven different colors. Textured finger points improve your grip and the finger guard keeps you safe while cutting.